This is the song New Divide by Linken Park. There is a gap fill activity, crossword puzzle, and some discussion questions. You could use this song to talk about the past and regrets. 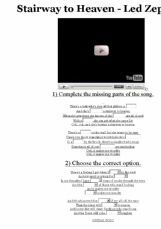 Listen to the song then choose the correct answers, fill in the missing words and spell check. Jason is very popular. Hope you like this song. 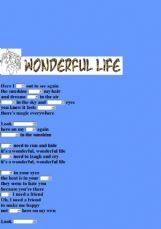 SS have to listen to the song and try to make out the words. Beautiful song. Good for beginners! An online excercise about a great song. An easy song to listen to and fill in; a nice way to get to know about a great man (Nelson Mandela) and about Apartheid. I used it within a project work on these topics.